Worship of the Almighty as Divine Mother is an age-old tradition in India and a refined part of Indian culture. It has been in existence since prehistoric times, but geographically it is limited to Asian countries in general and India in particular, in the current century. The history of ancient civilizations of Indus, Greece, Rome, Babylon and Egypt bears evidences to the worship of Divine Mother in different forms – nature, art, learning, culture and enlightenment. But Mother Worship has evolved from a tradition into a living religion for Indians. In Bengal, it has reached the highest level of devotion and faith in feminine manifestation of the Divine. In Bengal, Durga Puja or worship of Goddess Durga, an incarnation of Shakti, is the most pious and popular form of Mother Worship. In the Bengali community, the elderly people address young girls as Ma out of affection. “To look upon God as Mother is the purest and the highest form of Sadhana,” said Sri Ramakrishna, who is believed to have worshiped his wife as Divine Mother. Mother is all-in-all for a child. Kumari Puja, a special attraction of Durga Puja festival in Bengal, is held to celebrate this faith through ceremonious worship of young girls in sense of Divine Mother. Kumari Puja is called Kanya Pujan in North India. Bengal celebrates it on Maha Ashtami, the eighth day of Durga Puja, while it is held on the ninth day or the last day of Navaratri in other states of India. The place to be for Kumari Puja in Bengal is Belur Math, the headquarters of Ramakrishna Mission ashrams across the globe. Kumari Puja is held wherever Ramakrishna Math & Mission is in the world. But, it is a cultural refinement, grand ceremony and spectacular ritual at Belur Math on the Hooghly River flowing between Howrah and Kolkata. Swami Vivekananda, the founder of Belur Math, had initiated Kumari Puja in appreciation of Sri Ramakrishna’s devotion to Divine Mother and faith in Mother Worship. 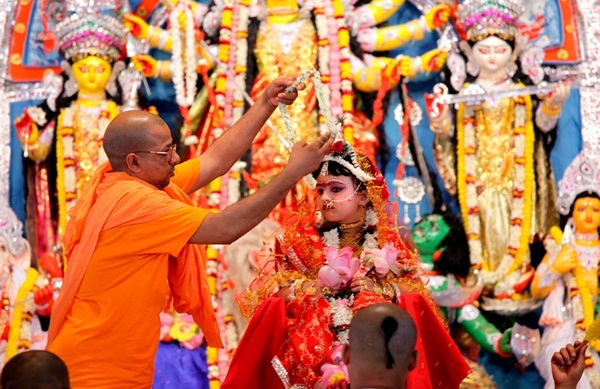 The saffron-clad monks of the Ramakrishna Order at Belur Math look upon a young girl as mother and worship her as a goddess, on Maha Ashtami. According to Sri Ramakrishna, little girls at the tender age when they are away from negative forces of the materialistic world are manifestations of the Divine Mother. A little girl at the pre-puberty phase of her growth is bathed in the holy Ganga water, dressed in a crimson red or fiery yellow sari with golden border, and adorned with jewelry. The same rituals are performed to worship the Kumari (young unmarried girl) and the same offerings are made to her as those during the worship of Goddess Durga. She is purified and sanctified through chanting of holy mantras. A spectacular arati is performed. Monks and devotees offer flowers at her obedience. The devoted hearts invoke her blessings through prayers. Kumari Puja at Belur Math fetches in a huge gathering of devotees, every year. Even, the whole ceremony is live telecast all over West Bengal. To say in other words, Kumari Puja at Belur Math is a sacred celebration of the celestial bonding between the Divine and the human. Needless to say, the Kumari Puja ceremony is worth booking last-minute flights to Kolkata during the Durga Puja festival. Travel Beats is an Indian Diaspora news portal by Indian Eagle, a leading travel organization for overseas Indians having a proven record of booking last minute flights tickets to India. We at Travel Beats connect Indians abroad, including Indian Americans with their cultural heritage roots through our stories and features. Hi Salil. Sorry! We are not exactly in the know of the selection criteria. Be advised to contact Belur Math directly.